This baby food containers is applicable to all types of powdered milk, high-grade tea, fruit, gelatin, ginseng, bird’s nest, velvet and other food storage containers can be repeatedly used. 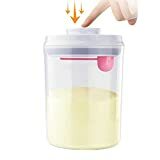 Built-in silicone seal, better sealing lid to prevent moisture, moisture trap bacteria. Removable lid, easy disassembly, easy to clean, eliminating pollution food storage set. Ergonomic design, the unique curvature of the well-built, all in the hands of the elegant, 360 ° take whatever, adults and children can easily crawl. PYRUS food storage containers airtight can be widely used for storage of food, medicine, milk powder, candy, nut, dry food etc.